The Best Packaging Catalog In Your Mailbox! 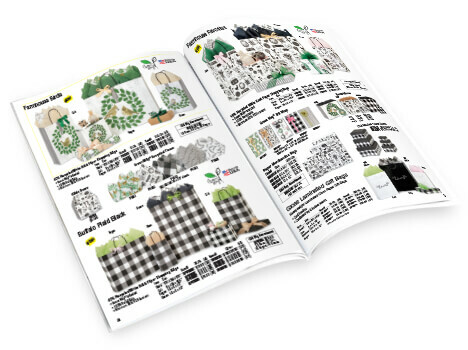 Check out our Digital Packaging Catalogs! 1. Click on the catalog below. 2. Navigate using the arrows. 3. Zoom in for a closer look. The digital version of our big Spring & Summer catalog. All your packaging needs in one place! Click any item to be taken to it on our website for full info and ordering. Easily shop all of our Easter packaging! Click any item to be taken to it on our website for full info and ordering. All of our wonderful Wedding packaging in one convenient catalog! Click any item to be taken to it on our website for full info and ordering. Sullivan Gift Wrap are beautiful, high-style designs, and there is something for everyone with their large selection. Sullivan typically ships the next business day. A great way to look at many other styles, sizes and designs other than those in-stock at Nashville Wraps. Shamrock Gift Wrap typically ships the next business day.